The advent of reliability engineering tools coupled with the cost of oil and gas operations has changed the paradigm of maintenance technology. A simple strategy of efficient replacement of failed equipment/component has been transformed into a more complex but proactive approach for keeping equipment running at peak efficiency concept of "total process" reliability engineering and maintenance. 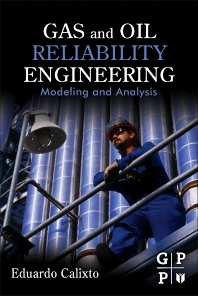 Applied Oil and Gas Reliability Engineering: Modeling and Analysis is the first book to apply reliability value improvement practices and process enterprises lifecycle analysis to the Oil and gas Industry. With this book in hand, engineers also gain a powerful guide to the most commonly used software modeling tools which aid in the planning and execution of an effective maintenance program. Easy to understand, the book identifies equipment and procedural problems inherent to oil and gas operations then applied a systematic approach for solving them. In this book, the author combines qualitative and quantitative methods with powerful software modeling tools to assist engineers in formulating a custom maintenance policy which will ensure process efficiency, reduce projects cost, reduce redundancies and optimum equipment replacement time. Eduardo Calixo is currently a RAMS expert, performing different reliability engineering and safety engineering analysis for Philotech GmbH in Germany. Eduardo has over 15 years of experience working in reliability engineering and safety for the oil and gas, railways, and mining industries. Previously, he has worked with many companies internationally as a reliability engineer such as Petrobras, Genesis Oil and Gas, and Reliasoft along with collaborating on projects with multiple major oil operators such as Chevron, Shell, and Kuwait Oil Company. Eduardo received his Bachelor in Industrial Engineering and his M.Sc. in Safety Management, both from Fedearl Fulminense University in Brazil and his D.Sc. in Energy and Environmental Engineering from the Federal University of Rio de Janiero.